Nobody knows luxury like the experts at BMW. The highly customizable 4 Series gives drivers the choice of a coupe, four-door, or convertible model. Offering an outstanding standard of performance, the 4 Series sports the patented BMW TwinPower Turbo engine delivering up to 320 horsepower. The unparalleled power boasts a 0-60 time of as fast as 4.6 seconds. The available LED headlights combine with standard LED fog lights to give off an extra light when needed in hazardous driving conditions. The distinct LED rear lights add an additional layer of expert styling. 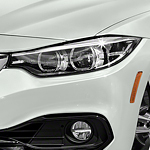 The BMW experts and enthusiasts at BMW Portland are ready to answer any questions you have about the 2018 BMW 4 Series. Our team of friendly associates is eager to demonstrate all of the unique features of this venerable luxury car when we take you out for a test drive. We look forward to serving you today!